The space that couldn't get any better - until it did! Take a look at this outdoor living space in Milledgeville GA. 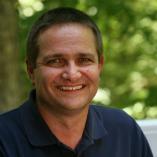 This local college professor had a great vision for where he wanted to rest and unwind when not teaching at Georgia College & State University. 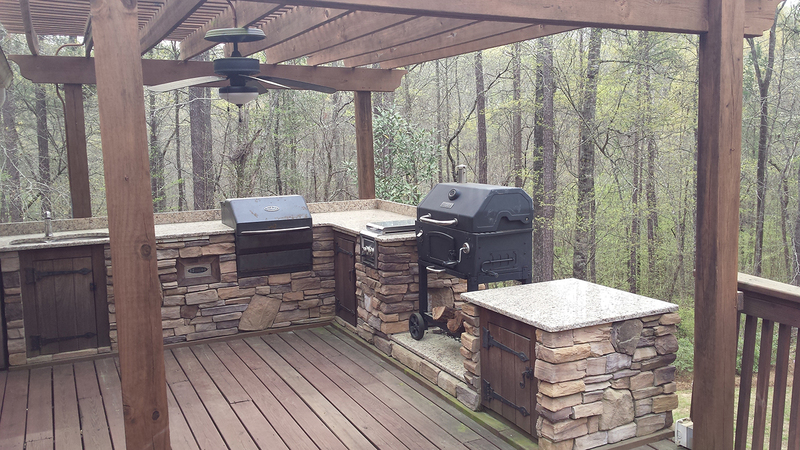 Archadeck of Central GA built his outdoor living space back in 2010. The deck included the ultimate outdoor kitchen complete with refrigerator, grill, oven, smoker, storage areas, a cook top and even a sink for food prep. The professor knew he wanted a pergola atop. The pergola not only adds a beautiful aesthetic and ambiance, but it also adds a degree of shade. The outdoor kitchen facade is beautifully covered in cultured stone. The storage area doors are custom built with Ipe Brazilian hardwood. This hardwood serves a larger purpose than it’s stunning rich look. Because the doors were near a grill, they needed to maintain a certain fire rating. Ipe is so dense that it maintains a fire rating high enough to sit aside a grill or even to face an outdoor fireplace. Believe it or not, it gets more beautiful! 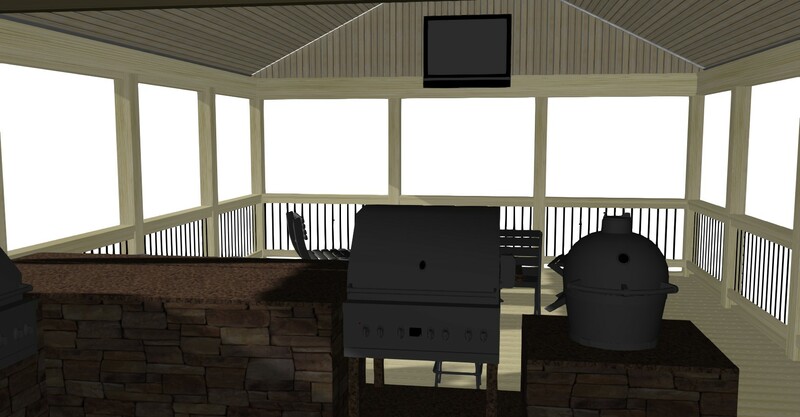 Take a look above at the plan for phase 2 of this incredible Milledgeville deck and outdoor kitchen. While the homeowners used the space regularly, they found that they wanted more shade and a larger space. They were wheeling their TV outside to enjoy watching TV outdoors but had to wheel it back in at the sight of rain or at the end of the day. Converting the pergola into roof cover would indeed make their beloved space the space that allowed for all the ways they want to live outside. 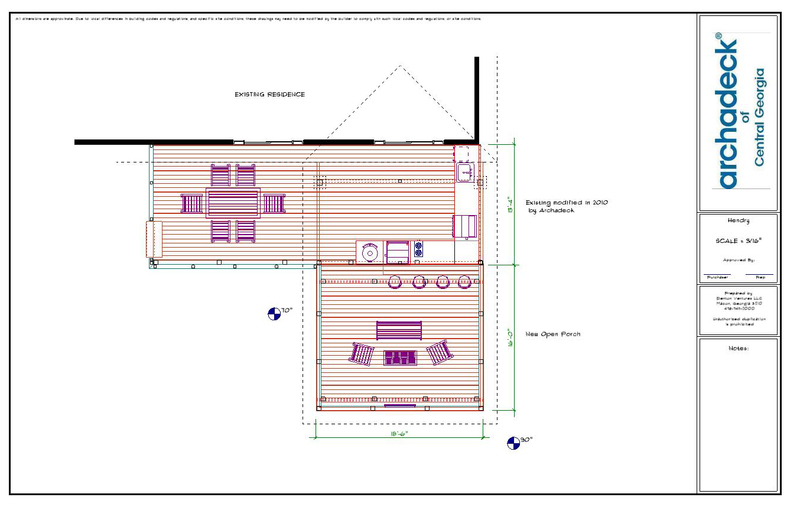 Above is a design rendering for their new outdoor space. At Archadeck of Central GA, it’s important that our clients see exactly how their new space is going to look. We not only provide architectural renderings but also show those in 3-d from various views. As you can see, this space is not only being converted to a porch but it’s also being extended to include quite a bit of additional space. To keep the light and airy feel, the screened porch will have a gable roof creating a high vaulted ceiling inside. The porch will be complete with Fiberon Horizon decking in Ipe color. The new railing will include Fortress iron black metal pickets. As soon as this outdoor upgrade and remodel is finished, we will bring you another blog with finished pictures. Hold tight to see this space completely transformed. Contact us for a free consultation. Call us at 478-745-2000, email us or fill out the form below and we will quickly get in touch with you.